Faliraki is about 15 km south of Rodos Town and is one of those destinations in the Mediterranean that European teens like to visit to party all day and night and have lots of drinks and fun. Nearby is the settlement Neohori with many bars placed especially on the road Orfanidou, which was named as the new Faliraki. Other similar destinations are Malia and Hersonissos in Crete, Laganas in Zakynthos, Kardamena in Kos and Ayia Napa in Cyprus. 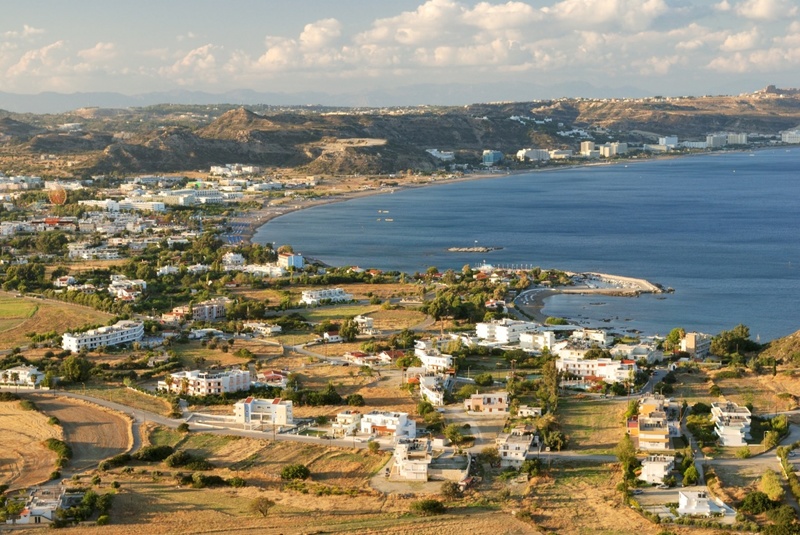 Faliraki is one of the most popular and cosmopolitan resorts on the island of Rodos and is distinguished by its remarkable tourist accommodations. Fun until the sun comes up! If you are looking for a particular type of entertainment, you have a huge variety to choose from - karaoke, British and Irish pubs, sports bars, disco. You will also find some quieter bars, but as you will see, the place is very busy with people dancing and drinking everywhere, even on the beach and the streets. Why don't you? When the party is over, relax in one of the snack bars on the beach. If you are hungry there are over 60 restaurants to choose from various kinds, like Greek traditional cuisine, Chinese food, international cuisine, or Italian restaurants. As for souvenirs the shops stay open until late in Faliraki and you can find whatever you imagine! Faliraki has one of the largest (5 km) and best organized beaches in Greece with water extreme sports like bungee jumping and a famous water park, which is the biggest in Europe. The water park will offer to all visitors (especially to the children) remarkable and spectacular rides, unique splash pools and water slides. At Faliraki's beach, visitors can find an impressive golden sand, small rocks and pebbles. Various parts of the beach are, as we already said, very well organized with many trendy beach bars. But sometimes, parts of the beach front of the hotels are only for their customers. Near by the Faliraki's beach, is the beach of Kathara with sand and rocks (ideal for nudists) and the beach of Ladiko, known as the beach of Anthony Quinn, with the beautiful fortress Erimokastro, with ruins of an archaic wall, which is close to the sea, and is famous from the movie 'The Guns of Navarone'. Local attractions include the archaeological site at Sarantapichos (is located near the village Kalithies) that is believed to be part of an acropolis of the archaic period. Also you can visit the old monastery of the prophet Amos on a hill just outside Faliraki. About 5 km north of Faliraki there is Kalithea which is built around a bay full of pine trees. The interest of visitors is attracted by the group of hot springs, which are located at the Vodi Canaveral, known as 'Thermes of Kalithea' and they are spurting red water. In the shops of Kallithea Springs, you can find authentic items of Kallithea, like post cards, white and red wine and traditional sweet delicacies. 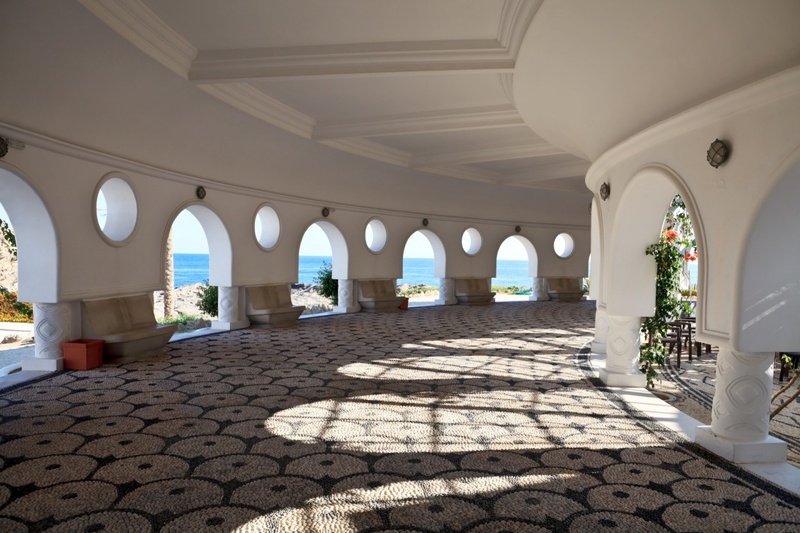 You can also visit the facilities of spas, which were built during the period of Italian occupation. Although they are closed nowadays, they are always one of the places, that every visitor must see in Rodos. DO: Go your adrenaline high by trying one glider flight over the night city of Faliraki. DON'T: Sleep early, you can have fun here until the morning! You don't want to miss that. Find information about selected Hotels, apartments and rooms in Faliraki to choose the perfect place for your accommodation.